For documents where data needs to be on the shared drive but not altered there are a few options to setting restrictions. Users can mark the document as final, set read-only access, set a password restriction. The “Mark as Final” command, available in Microsoft Office, signifies that the user is opening a completed and final version of a document. This also prevents users from making inadvertent changes to the document. The “Mark as Final” command is not a security feature. Any user who receives an electronic copy of a document that has been marked as final can edit that document by removing the “Mark as Final” status. 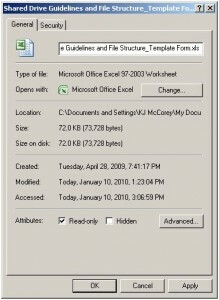 Documents that have been marked as final in Microsoft Office system program will not be read-only if they are opened in earlier versions of Microsoft Office programs. In earlier versions of Microsoft Office, documents settings can be applied to make a document have read-only access. The read-only access feature should be applied if an author does not want users to accidentally edit or modify a document. A read-only document can only be read or copied. Only the author can make changes to the original document by de-activating the read-only protection. If changes to a read-only file are not made by the original author, the changes can be saved by giving the file a new name. Read-only access can be applied in two ways. The first is through the “General Options” dialogue box when saving a file. The following are directions on how to do this. Click “Tools”; then click “General Options,” which will open the “General Options” dialogue box. In the “General Options” dialogue box, check the “Read-only recommended” check box. Click OK to exit the “General Options” dialogue box. The second option is to activate the read-only through the document properties window. Find the document in Windows Explorer and right click on the document. Choose “Properties” from the context menu. This will open the “Document Properties” dialogue window. Check the box next to “Read-only” under the “Attributes” section. 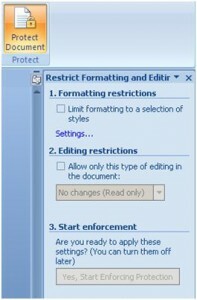 In Microsoft Office, document settings can be applied to make a document password protected and/ or restrict options. Password access should be applied if an author does not want users to access a document for confidentially or security reasons. A password-protected file can only be accessed or modified by users who know the password. If password protection is no longer necessary, usually the original author must deactivate. 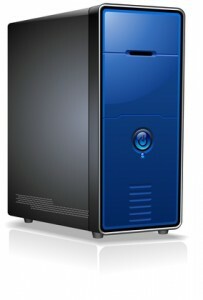 Note: If the password is lost or forgotten, the document can not be opened and must be deleted. To activate password protection, go through the Protect Document wizard. The Protect Document tool icon is located as the last icon under the Review tab ribbon. 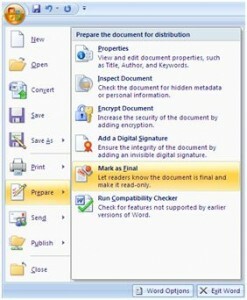 Click on the Protect Document icon and the wizard will open in a sidebar to the right of the document. The user may customize each editing option for a document by clicking in the check box next to the first two options. Once finished, simply click in the “x” in the upper right hand corner of the wizard. Taking on the task of reorganization and structure of the shared drive can be daunting. It is important to choose the right internal person to assist and manage this type of project. This type of project requires someone or a team to create user-friendly, standardized, comprehensive, and extensive file structure, taxonomy and data/record management guidelines. Sometimes an organization delegates the project to entry level or administrative staff. However, with limited decision-making authority, these individuals are often hesitant to change, alter, move, or remove files and documents from the shared drive network. Further, without buy-in from all employees, revised structures developed by one staff often can end up to be a short-term solution and not long lasting. It is important for organizations to train internal personnel, engage a team, or hire consultants who have IT knowledge and understanding along with a clear process of how to facilitate groups to develop guidelines and an electronic file structure that can last into the future. These project managers or consultants are essentially in organizing the project, facilitating the process and providing counsel on data management best practices. Good knowledge of file extensions. Information management, technology and professional organizing consultants can provide the service that offers the expertise needed to develop shared electronic file guidelines and structure. To learn how to organize electronic files on the shared drive, download the report How to Organize Electronic Documents on Shared Drive Networks. Or you are welcome to contact us and we can assist you.